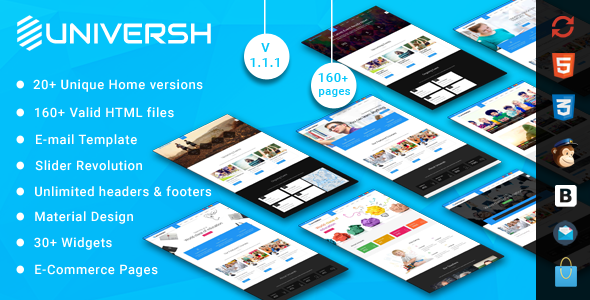 Universh is a unique HTML5 theme using the material design for Material Education, Events, News, Learning Centre & Kid School. Though it is perfect for educational organizations such as the University, School, Online Course & Training Center, it?s still flexible enough to be used for business website and creative digital agencies. So we know exactly which features your Learning business should have on the website. - Added: Home Book Landing. - Added: Shop cart, Checkout, Login. - Added: Added Shop Grid 2, 3, 4 Column, Shop single, Shop Single left sidebar, Shop Single Right Sidebar.